Addiction can affect anyone, and seniors over the age of 55 are no exception. The wonderful staff at Discovery Institute of New Jersey’s rehab for seniors is specially trained to treat this population for drug and alcohol addiction. One of the biggest challenges about getting seniors the help they need is that admitting one has an addiction or alcohol problem is often very difficult, especially for people who may be deeply established in life and face shame and embarrassment at the idea of asking for help. In these cases, intervention from caring and supportive family members might be crucial in getting patients to enroll in an addiction treatment center’s program. However, help from loved ones and family members may be the first step in helping these clients begin their journey towards a happy and fulfilling life free from drugs and alcohol. Once in treatment at Discovery Institute, seniors will be made comfortable and secure in a reassuring and positive environment. Our residential facility is modern and comfortable, with easily accessible amenities for all of our clients. We specialize in accommodating all of the specific medical needs of our clients. Part of our admissions process at the Discovery Institute is an extensive medical exam conducted by our professional staff of doctors and nurses. During this intake exam, staff will assess the physical, mental, and emotional health of clients in order to create a comprehensive and effective individual treatment plan for each client. We understand that the senior population at Discovery has specialized needs, and we strive to meet them every day. Our doctors are aware that many of our senior patients enter treatment with outside physical ailments that require treatment. Our medical staff is equipped and trained to address all of these conditions, from chronic illnesses like diabetes and cardiovascular issues, to acute issues such as fractures and sprains. Clients’ physical health will always be taken care of while they are in treatment at Discovery. Many senior citizens are on medication regimens to manage illnesses and chronic conditions. Our doctors work with patients to evaluate their medications and adjust any that need to be changed. Case management services are available to help patients establish a routine in order to ensure that they comply with their medication regimen once they graduate from treatment at Discovery. Emotional regulation is a skill that requires support and care in order to learn. Our therapists and counselors at Discovery are experienced in guiding patients through difficult emotions and feelings in a supportive way. While at Discovery, patients will receive excellent therapeutic care from our staff. Addiction can strain important family relationships. At Discovery, we have a family counseling program that allows our clients and their loved ones to process emotions and experiences, set boundaries, and reconnect with one another in a therapeutic, safe environment. Chronic illness affects many of our senior citizen patients. Our doctors and nurses along with our clinical staff work together to help patients establish healthy routines that prevent the onset of addiction-related illnesses and manage the symptoms of ailments that the patients may be currently suffering from. Every interaction clients have with staff is done on a private, confidential basis. Clients will receive support and guidance through every aspect of their treatment in a manner that protects their dignity, space, and right to privacy. Nutrition is an important aspect of healthy living and well-being that often gets neglected when a patient is engaged in active addiction or alcoholism. Meal planning and nutritional counseling are available at Discovery to help patients maintain optimal physical health inside and outside of a treatment setting. Our staff is always available to patients who need help with any issue, at any time of the day. We offer 24/7 assistance in order to ensure that we are always meeting all of our clients’ needs. 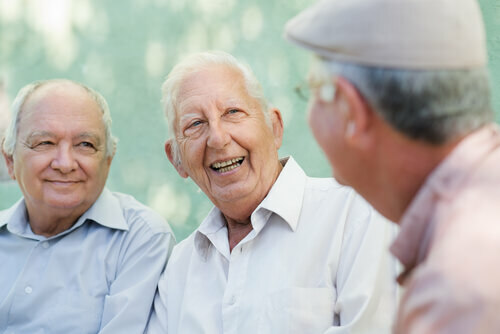 While in treatment, senior patients will have opportunities to connect with peers who struggle with addiction issues in order to build sober support networks. These relationships will support them in their ongoing journey towards lifelong recovery from drugs and alcohol. Patients are sent home from treatment with a comprehensive, long-term plan for recovery that will aid them in building a sober life outside of a clinical setting. This treatment plan is always individualized to cater to each client’s needs. Senior citizens who struggle with addiction and alcoholism can get back to living the happy, healthy, and sober life they deserve. From the moment they enter our facility, we start planning a unique treatment plan for each person, which includes aftercare support and planning for long-term sobriety. At Discovery Institute, we strive to effectively and compassionately treat senior citizens who struggle with alcohol and drug dependence so that they can build healthy, fulfilling lives when they leave treatment.